(Updated at 4:25 p.m.) Arlington County police and medics have responded to Clarendon after a promotion for free cheesecake got out of control. 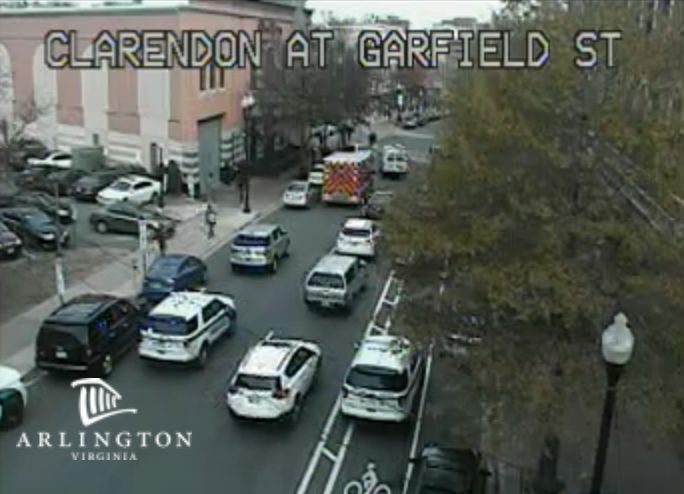 Police were called to the area of the Cheesecake Factory at 2900 Clarendon Blvd earlier today for a report of a large crowd and heavy traffic in the area. Around 1 p.m., another dispatch went out for a fight in progress at the restaurant, though officers did not find an active fight when they arrived. The culprit: the Cheesecake Factory is giving away free slices of cheesecake in honor of its 40th anniversary, but only to those who order on Doordash. The result, according to an Arlington County Police spokeswoman: an unruly crowd of delivery drivers inside the restaurant, trying to pick up orders, and a rash of double parking around the Clarendon area. The scene was “a little hectic” and officers were working to bring order and “calm the situation down,” ACPD spokeswoman Ashley Savage told ARLnow.com. During the fracas, according to Savage, one person refused police commands to leave the restaurant and a struggle with officers ensued. That person was arrested and is expected to be charged with disorderly conduct, Savage said. He requested to be transported to a local hospital by medics for evaluation of possible injuries. In celebration of our 40th anniversary, on December 5th only starting at 11:30AM local time, we’re giving away 40,000 FREE slices* of cheesecake! Get a free slice* of cheesecake when you order delivery through DoorDash! Use promo code FREESLICE at checkout. Get it while you can because an offer this sweet won’t last long! As an added bonus, DoorDash is offering $0 delivery fee** on all of The Cheesecake Factory delivery orders from December 5 – 11! No promo code needed! There are social media reports that the promotion has caused chaotic scenes at other Cheesecake Factories across the country. Later Wednesday afternoon, photos and video emerged on Twitter that appeared to show the arrest and some of the chaos inside the restaurant.